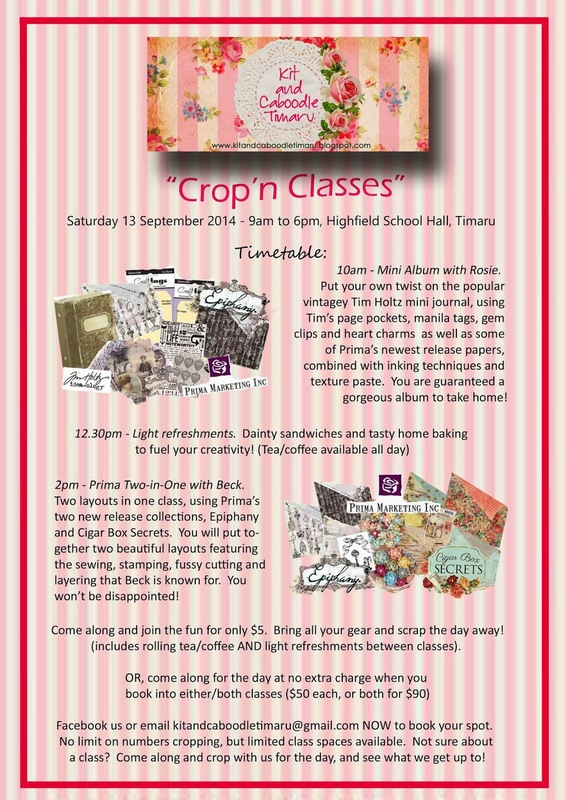 Come join us on Saturday 13th September from 9am-6pm at the Highfield School Hall on Rimu Street. We promise you a giggle or two! Just $5 to crop the day away, with light refreshments at lunchtime, or do a class and take home a lovely project or two. Classes are $50 each or $90 for both, and we have two great options for you... Rosie's vintagey mini album, pocket page style, using fab Tim Holtz and yummy Prima goodness, or two Prima layouts in one class with Beck. Check out the flyer for a sneak of the product to be used, currently winging it's way from America. Now, don't fret if you can't join us on the day, the Kits will be available for purchase, with courier only $7.50 nationwide. Bargain, I tell ya! There is no limit to the numbers able to crop on the day, but kit numbers (and therefore class spaces) will be limited. Some are already pre-sold! Get in touch with us NOW if you would like us to reserve you a seat - for a class, or just cropping.